Inversion tables and chairs are mostly preferred by people that suffer from back pain and the way they work is release this pain is by decompressing, elongating and strengthening the spine gently and separating the vertebrae by using the gravity and your body weight. Stamina In Line 55-1550 is an inversion chair with an ergonomic design, a solid and sturdy build and features that make it rather comfy and safe to use. You can get on and off it easily, especially if you have joint problems and restricted mobility. Security features of this brand new inversion chair include a lap belt that is adjustable, a ratcheting leg lock with a push-button release to lock and unlock the legs without any discomfort at all, as well as an ankle support (for lower calf and ankle) that is padded nicely for your comfort. Foot bar is easily adjustable for accommodating people of different heights- short and tall and reachable when in a sitting position. The upholstery on the unit is properly cushioned for your comfort and the handles are also nicely padded and are both very easy to clean. The handles make it easy to start the rotation- push into inversion and pull into seated position easily. You can control the inversion angle with the nylon adjustment strap provided- looser for more inversion and tighter for less, so you stay in your comfort zone. It has a very sturdy steel frame that can carry a maximum user weight of up to 250 pounds and comes with rubber floor protectors that are anti-slip to ensure stability during your inversion or when you’re getting on and off the chair. 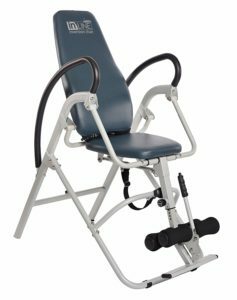 This great inversion unit is not only beneficial in offering you release from the back issues but also offers a fun experience on its comfy cushioned seat and backrest with padded ankle supports. 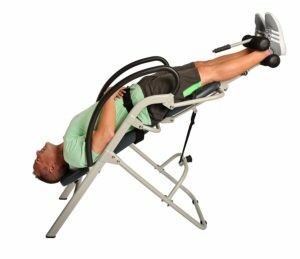 You sort of become vulnerable when you’re in an inverted position, but this chair makes it feel better and safer for you as it is designed for your security with features like solid steel frame, anti-slip rubber floor protectors, comfy ankle support (your ankles may hurt on some of the inversion tables), adjustable lap belt as well a ratcheting leg lock. Stamina In Line is a heavy-duty product that is also lightweight at just 20 pounds and with measurements of 44.5 x 23 x 53 inches, so it is a little bulky. It is easy to assemble with the clear instructions manual as complex as it may look and as soon as you start using it, you will realise how nice and comfy it feels even if what you’re looking for is just a nice stretch. It is the cheapest inversion chair on the market despite being very well constructed and functional. It is not a foldable design unit which may be not so convenient in a way but it is also the reason why it is not wobbly or shaky and is also quite stable due to the low height-to-base ratio. It is great that you have the very sturdy steel frame but lacks powder coating, so you will soon see scratch marks, which shouldn’t be a biggie as you’re already getting quite a bit for the price. The risk of your body sliding when fully inverted is greatly reduced by the pressure being distributed to three points on your legs, rather than two and the pressure on your ankles will be reduced. You’ll just need to adjust your leg length when you are seated comfortably and you will not need to bend down. The backrest is only 32 inches long and this may make it not so comfy for very tall people (more than 6’2″). The maximum you can invert is around 70 degrees, not the full 180 degrees. Other than these couple of drawbacks, it is a great inversion product to look into.